Who: Dr Melvin Look, 53, a consultant surgeon in gastrointestinal, laparoscopic and obesity surgery. He also has a special interest in endoscopy and the treatment of digestive diseases. Married to a gastroenterologist with a teenage son, he is a director at multi-specialist surgical group practice PanAsia Surgery. HOW IMPORTANT IS IT TO HAVE A HEALTHY GUT? The gut plays a much larger role than just digesting food. It actually has an overarching influence on your whole body – your mental state and emotional well-being. A leaky gut can trigger immune-related problems that can lead to allergies, auto-immune diseases, arthritis, liver disease and obesity. A healthy gut should provide effective digestion, absorption and processing of food so you can enjoy your meals and have regular and satisfying bowel movements. HOW CAN WE PROMOTE GOOD GUT HEALTH? Avoid things that disrupt the gut, such as a diet that is high in fat and sugar. Other things that disrupt the gut include stress, smoking, too much alcohol, as well as inadequate and excessive exercise. Opt for a balanced, more plant-based diet. Eat meat in moderation. Our gut communicates with our brain to affect our mood and energy metabolism. It also has a complex barrier system that is densely populated by microbiota, the community of micro-organisms living in our intestines. Probiotics and prebiotics can be taken as a supplement if dietary intake is inadequate. I will seek simplicity, clarity and depth. It will be a quiet meal at a sushi-ya with just the sushi master, his sharp knife and no words spoken. I will finish off with a Kopke Colheita Port from 1965, the year of my birth and bottled in 2015 to mark Singapore’s 50th anniversary. I can’t get enough of eggs. I can have them for breakfast, in oyster omelette or orh luak, roti prata or carrot cake. WHERE ARE SOME OF YOUR FAVOURITE PLACES TO DINE AT IN SINGAPORE? I prefer restaurants that serve lighter fare with a modern touch. For me, good examples of such restaurants are Tippling Club and Bam!, both in Tanjong Pagar, and Iggy’s at the Hilton Singapore in Orchard Road, a long-time favourite. The dishes at Iggy’s are produce-driven and always push the boundaries. For business lunches, dim sum at Crystal Jade Golden Palace in Paragon Shopping Centre is always reliable and efficient. The har gao (shrimp dumpling) is delicate and the shrimp are always fresh and have a nice bite to them. I also like the full flavour of the crisp-skinned siew yoke (roast pork) there. I recently rediscovered Salt Grill at Ion Orchard after not having dined there for a while. The view from the restaurant is stunning on a clear day and, now, with a new head chef, there is greater emphasis on quality produce. For my local food fix, I like the white carrot cake topped with crispy ikan bilis at Golden City Carrot Cake in Telok Kurau. WHAT IS YOUR PET PEEVE IN RESTAURANTS? The increasing number of restaurants that charge customers for a glass of tap water. Many diners may end up ordering a soft drink instead. We may see a new generation of Singaporeans growing up accustomed to sugared beverages with their meals. This can lead to a rise in diabetes and obesity. I think the Government should take the bold step of legislating the provision of free water at all establishments. Restaurant owners should see the provision of free tap water as their contribution to building a healthier nation. YOU HAVE HAD THE PLEASURE OF DINING WITH ACCLAIMED JAPANESE FOOD WRITER MASAHIRO YAMAMOTO. TELL US ABOUT THAT EXPERIENCE. We had dinner together at the now-defunct Restaurant Andre a few years ago, before it was awarded two Michelin stars. Sushi fans will remember Yamamoto as the food critic who was interviewed in American David Gelb’s 2011 food documentary, Jiro Dreams Of Sushi. We were put in touch through a mutual friend. 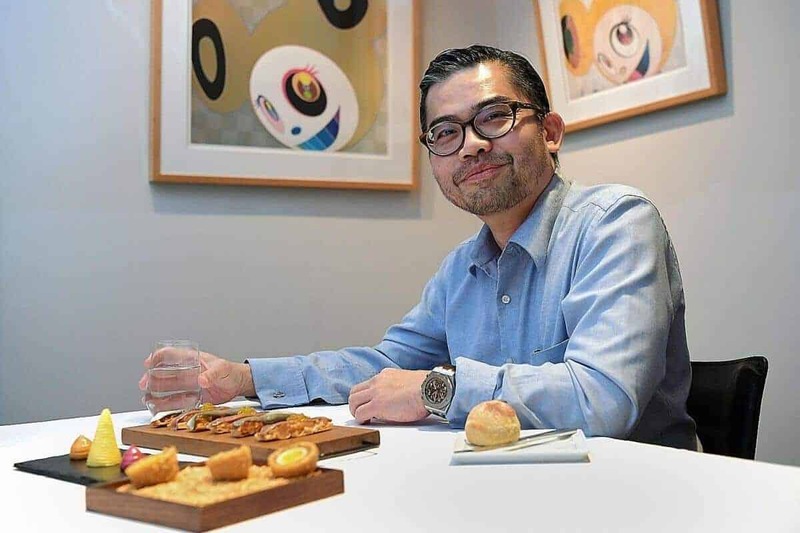 Chef-owner Andre Chiang was on hand to explain his philosophy behind each dish. It was almost surreal to witness the interaction between an artist and an appreciative critic and taste the magnificent, edible art. YOU ARE MORE FOND OF WHISKY THAN WINE. HOW DID YOU GET INTO WHISKY? My earliest memory of whisky is from 1993, when I was in Edinburgh for my medical exams. My friends and I celebrated with whisky after our exams. I associate it with good times and good memories. These days, I drink whisky a couple of times a week to relax. WHY DO YOU LIKE WHISKY AND WHAT ARE SOME OF YOUR FAVOURITES? It pairs well with food and you can enjoy it slowly after a meal. You can imbibe it in small quantities and the quality of an opened bottle will not deteriorate with time. I like the complexity of whisky. It is evocative and can transport you to the place of its origin. I find single malts from the isle of Islay in Scotland particularly interesting because of their additional dimension of peat. My favourites include whiskies from Caol Ila, a distillery near Port Askaig on the isle of Islay, as well as the now-defunct distillery Port Ellen. I also like Japanese whiskies from distilleries such as Nikka.